Metrolinx to VIA: No dice. Oh the possibilities! 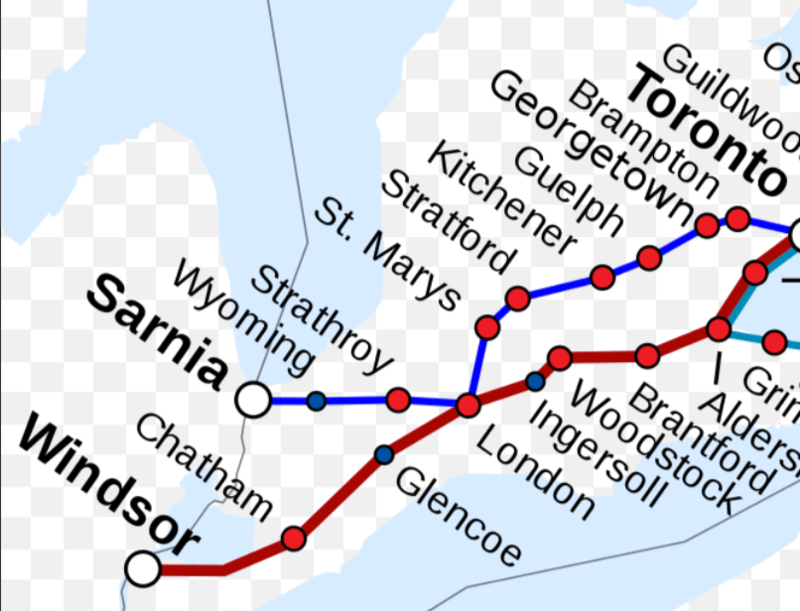 VIA Rail’s route (in blue) from Union to London. VIA Rail trains pass (without stopping) through Weston twice a day in each direction on their way from London to Toronto’s Union Station. Some passengers from London, Kitchener, Guelph, Stratford and other stations along the route are headed to Pearson and it seemed like a no-brainer for those passengers to simply exit at Weston and hop aboard the airport train thus saving themselves time and money. Another plus, Westonians would have another way to travel westwards along that route and even catch a ride to Union in the other direction twice daily. Enter Metrolinx. Metrolinx has said no. Apparently the arrangement is too hard to accomplish because of tight scheduling, passengers would only have 60 seconds to get off the train. Compared to regular UPX stops of 30 seconds, this seems like quite a generous allocation; especially since few will likely be getting off. Why the foot dragging from Metrolinx? Well for starters, that’s a precious revenue loss if passengers can get a cheaper fare to the airport from Weston. Second, it’s an inconvenience to have a tight schedule to worry about. Third, why bother; it’s only Weston. Bottom line: Laura Albanese, Ahmed Hussen and Frances Nunziata should be screaming from the rooftops for Metrolinx to add this (however small) amenity to Weston. Larger scheduling problems have been solved in the past. According to an article in the Star, this decision is not carved in stone. Let’s hope that our representatives can bring some pressure to bear; soon. The Weston UP station will ultimately close…….and no one, will do a thing about it. Probably right about Weston UP station eventually closing. I visit kitchener often and it would be so convenient if the via rail could stop in Weston. What pressure do our representatives respond to? I honestly don’t know – This would be Ms. Albanese’s (Metrolinx) and Mr. Hussen’s (VIA Rail) area – I don’t hold out much hope for effective pressure to be applied. Next Next post: UPX numbers are in: it’s bad. Again.